Law school is a serious affair, famous for the demands it places on law students. 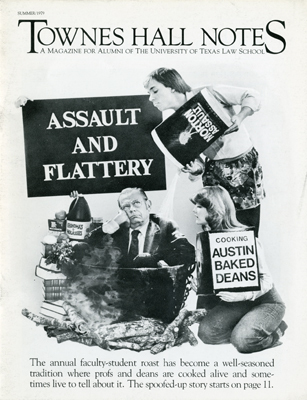 Faced with the pressures of legal education, it is little wonder that the students of The University of Texas School of Law sought comic relief, establishing the now beloved tradition known as Assault & Flattery. Originally a talent show in which various law school groups competed during Law Day in the 1950s, Assault & Flattery developed into a complex parody. While Assault & Flattery has occasionally encountered challenges ranging from stagnation to controversial sketches and disapproving faculty, it remains a beloved and vibrant part of the law school experience at The University of Texas School of Law.